Professional Services firms are leading other industries through their rapid adoption of cloud applications to run their business because of the nature of their business. Today’s LOB executives are increasingly tech savvy and empowered by the cloud. In a recent IDC survey1, 48% of LOB executives said that the link between business results and technology is increasing and that they felt a sense of urgency to implement new technology initiatives. Professional Services firms are driving innovation by connecting the entire enterprise with SAP S/4HANA and then tailoring, integrating and expanding the digital core with SAP Cloud Platform. SAP Cloud Platform is the Platform-as-a-Service from SAP which enables customers and partners to develop and run their own apps. SAP Cloud Platform offers mobile services including the Apple SDK for an optimized iOS experience. It offers portal technology to quickly create individualized portal sites for customers, business partners and employees. It supports process integration, IOT services, in-memory data management (HANA) and machine learning capabilities. 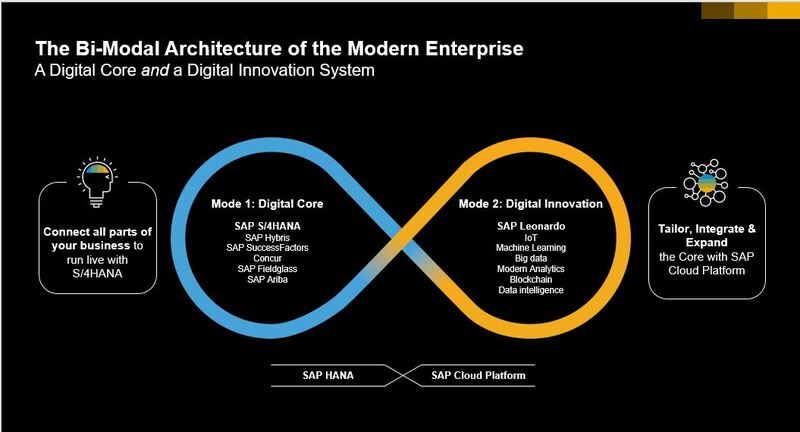 The bimodal IT approach, in which SAP S/4HANA core mission critical applications are decoupled from line of business edge applications that are developed on the SAP Cloud Platform, allows companies to innovate in both the core and the edge applications but each at their own pace. Let’s take some examples of customers and partners deriving value from SAP Cloud Platform by extending the core with apps running on the platform or creating new apps to run on SAP Cloud Platform. Accenture has developed an extension of human capital management solution SAP SuccessFactors on SAP Cloud Platform to provide audit and compliance services for their customers in the cloud. ZS Associates, a US based consultancy, has also deployed the Audit and Compliance as a service app provided by Accenture. Professional Services firm T.CON based in Germany has developed a leave approval request process by using the workflow capabilities of SAP Cloud Platform, orchestrating interactions between employees and managers to streamline the approval process. Belgium based global software house Delaware created their own internal time reporting app on SAP Cloud Platform which is fully integrated with their SAP S/4HANA Professional Services Cloud app. This application uses the mobile capabilities of SAP Cloud Platform and enables their consultants to enter their timesheets any time any place, thereby improving the accuracy of revenue forecasts for the company. Previously consultants would take longer to enter their expenses using their laptops, sometimes waiting until they returned to the office. The decoupling of the core business applications and the edge applications running on SAP Cloud Platform allows the line of business applications to be deployed instantly based on the evolving needs of the business unit while upgrades to the core can be effected quickly and effortlessly since it is not hampered by customizations and custom objects required to run the edge applications. Another great example of a value-added app running on SAP Cloud Platform is the alumni management app created by Enterprise Jungle to help enterprises manage a directory of their alumni base. EnterpriseAlumni helps large enterprises take advantage of “boomerang” hires by maintaining a current alumni directory utilizing LinkedIn data from prior employees. To learn more about how SAP Cloud Platform can help your Professional Services firm extend, integrate or use the mobility, User Experience or IOT services of the platform click here. This is the first of a series of blogs on SAP Cloud Platform for Professional Services.